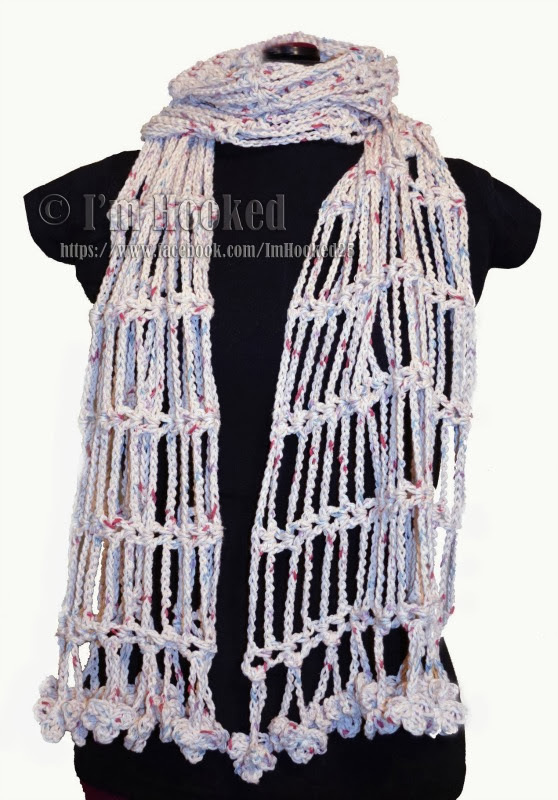 This is an airy type of shawl with flower tassels; a simple and yet classy-looking design. This easy project is perfect for beginners. You can make this shawl in any length or width that you desire. You can also use any type or weight of yarn and any sized crochet hooks. The shawl is made in one piece with no cutting involved. However, the tassels are made separately but they are all in one piece too. Starts with making chains, multiple of 9 + 5. This is the length of your shawl. Round 1: DC in the 5th chain, (first V-Stitch is made). *CH 8, skip the 8 CHs, V-Stitch in the 9th CH* Repeat from * to * across. Round 2: Turn your work and SS in the CH-1 space. CH 4 (count as DC, CH 1) and DC again in the same stitch (first V-Stitch is made). *CH 8, SK the 8 CHs, V-Stich in the next V-Stitch* Repeat from * to * across. Repeat Round 2 until you reach your desire width. Round 1: Chain 3 and SS in the 1st CH to form a ring. *CH 3, DC in the ring, CH 3 and SS in the ring* first petal made. Repeat 3 times or until your reach the desire number of petals. DO NOT cut the yarn, proceed to next round. Round 2: CH 34, SS in the 4th CH to form a ring. *CH 3, DC in the ring, CH 3 and SS in the ring* first petal made. Repeat 3 times or until you reach your desire number of petals. Fasten off. Pull the tails to shot the hole and sew it to be more secure. To attach the tassels to the shawl, fold the tassel and insert it in the V-Stitch edge of the shawl and then pull the tassels through the loop you made previously.